In 2014, 21 out of 22 sections of surface waters met water quality limit values set for assessing the capability of water to support freshwater fish life. Inapropriate water quality was detected in the cyprinid section of the Mura River between the road bridge in Petanjci and its confluence with the Ščavnica tributary (Mura Mota measurement site) due to excessive concentrations of ammonia, measured on 8 July 2014. The limit value for ammonia in cyprinid waters is 0.025 mg NH3/l, while the measured concentration was 0.043 mg NH3/l. In five sections (23%), water quality met the limit as well as the recommended values. In other sections, nitrite concentrations were the most frequently exceeded values, while ammonium concentrations were frequently exceeded in the salmonid sections. In 2005, a total of 22 sections (13 for salmonid and 9 for cyprinid species) of inland surface water that are important for freshwater fish species were designated in Slovenia (Rules on the designation of surface water sections important for freshwater fish species, Official Gazette of the Republic of Slovenia, No. 28/05). The sections of salmonid surface waters support salmonid fish species such as trout, grayling and huchen, while the sections of cyprinid surface waters support cyprinid fish species such as carp, pike, perch, etc. The purpose of designation of those sections is to protect or improve the quality of water that supports freshwater fish species. In the above-mentioned sections, the Environment Agency of the Republic of Slovenia monitors the quality of water in accordance with the Rules on the monitoring of the quality of surface waters supporting fish life (Official Gazette of the Republic of Slovenia, No. 71/02). National regulations are based on Directive 2006/44/EC on the quality of fresh waters needing protection or improvement in order to support fish life. The aim of the Directive is to protect or improve the quality of those running or standing fresh waters that support or, if pollution were reduced or eliminated, would become capable of supporting, fish belonging to indigenous species offering natural diversity and species whose presence is seen as desirable for water management purposes by the competent authorities of the Member States. The suitability of water to support freshwater fish species is assessed with regard to compliance with recommended and limit values of parameters defined by the Decree on the quality required of surface waters supporting fresh-water fish life (Official Gazette of the Republic of Slovenia, No. 46/02). The assessment covers parameters that affect the living conditions of freshwater fish species, such as the oxygen content, pH value, suspended matter, biochemical oxygen demand, the content of phosphorous, nitrite, ammonia, ammonium, free chlorine, dissolved copper and dissolved zinc. 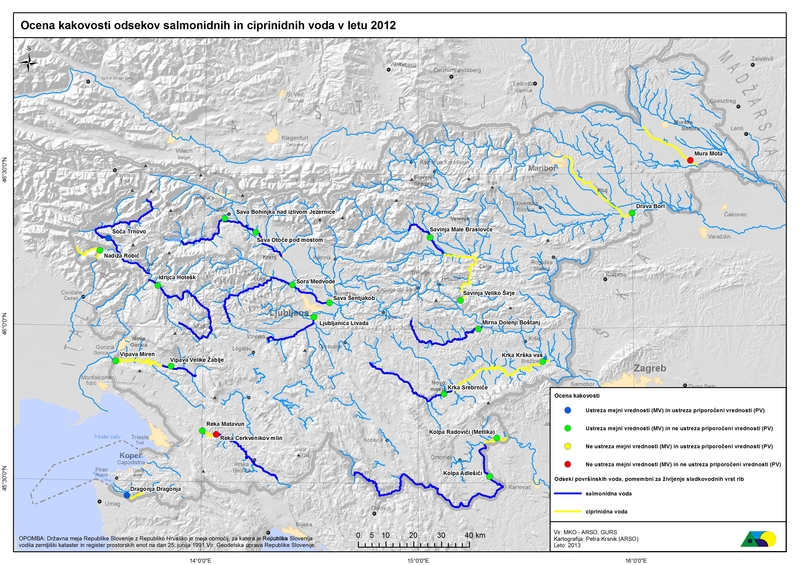 The quality of salmonid or cyprinid water is not suitable and is deemed to be over polluted when the measured values exceed limit values defined by the Decree on the quality required of surface waters supporting fresh-water fish life (Official Gazette of the Republic of Slovenia, No. 46/02). Water quality in salmonid and cyprinid sections is assessed as suitable when all parameters are below the limit values defined by the above-stated Decree. Water quality in salmonid and cyprinid sections is assessed as unsuitable when one of the parameters exceeds the limit value defined by the Decree. Water quality in salmonid and cyprinid sections is assessed as very good when values of all parameters are below limit values as well as below recommended values. To preserve the quality of waters supporting important freshwater fish species. The suitability of waters to support freshwater species is presented for 2014. 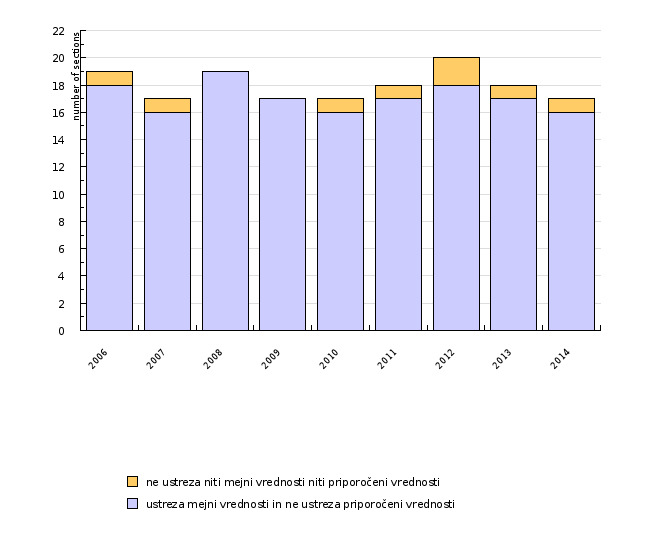 In salmonid waters, water quality in 2014 complied with the limit values in all 13 sections. The salmonid section of the Soča between its spring and its confluence with the Tolminka was assessed as having the highest water quality. In cyprinid sections, measurements were carried out at 9 monitoring sites. Water quality was assessed as unsuitable due to excessive content of ammonium measured in July 2014 in the section of the Mura between the road bridge in Petanjci and the confluence with the Ščavnica. The highest water quality in cyprinid sections (where all parameters were not only below the limit, but also below the recommended values) was measured on the Kolpa between its confluence with the Lahinja and the state border at Božakovo, the Krka between its confluence with Bršlinski potok and its confluence with the Sava, and the Dragonja between Škrline and the Dragonja border crossing. The recommended values that were most often exceeded were those for nitrite (in salmonid as well as cyprinid sections). Ammonium content often exceeded the recommended value in salmonid sections and only in one cyprinid section (on the Mura). The recommended value for ammonia was exceeded only in one Mura cyprinid section in July 2014. This was due to discharge of untreated urban wastewater, effluents from wastewater treatment plants and effluents from animal farms. In May and June 2014, average suspended matter was also exceeded in the Mura cyprinid section.